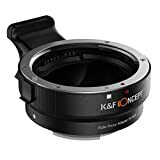 The lens mount adapter EF-NEX is designed to allow Sony E-mount series lenses to be used with E-mount lens compatible interchangeble-lens digital cameras lenses. Auto focus function; Built-in hand shaking IS function;Pass-Through communication allows for auto focus, aperture and exposure, infinity focus allowed. 1/4 female thread screw for mounting onto the tripod; Anodized aluminum construction with smooth surface for effortless mount. We engaged in Camera Accessories Industry for many years. A reliable credit standing is our tenet. We Promise High Quality, Competitive Prices and Excellent Customer Service. 2 Years manufacturer warranty,buy with confidence! This entry was posted in Discount Photography and tagged 3/3N/5N/5R/7/A7, Adapter, AdapterK&F, Auto, Canon, Concept, EFNEX, EMount, Focus, lens, Mount, Sony by Ball Photo. Bookmark the permalink.